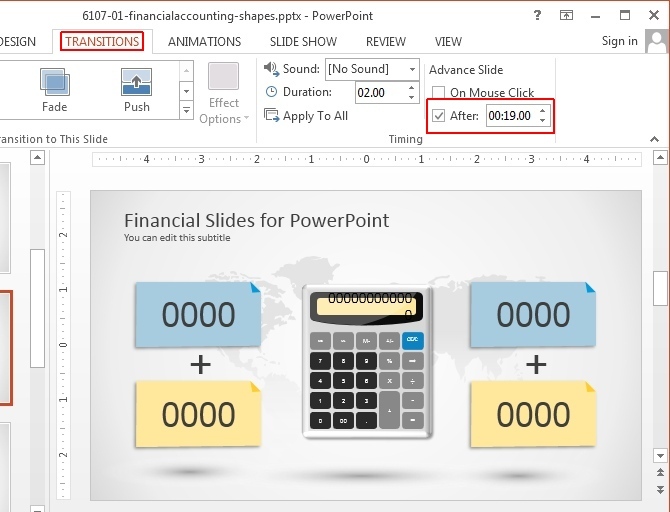 Usually, presenters use mouse clicks, keys from a keyboard or a remote to switch slides in PowerPoint. However, if you have your presentation well-timed or have to account for every second in a presentation due to time constraints, you might want to make sure that your slides are well-timed. To do this, you can add a time duration to switch your slides. 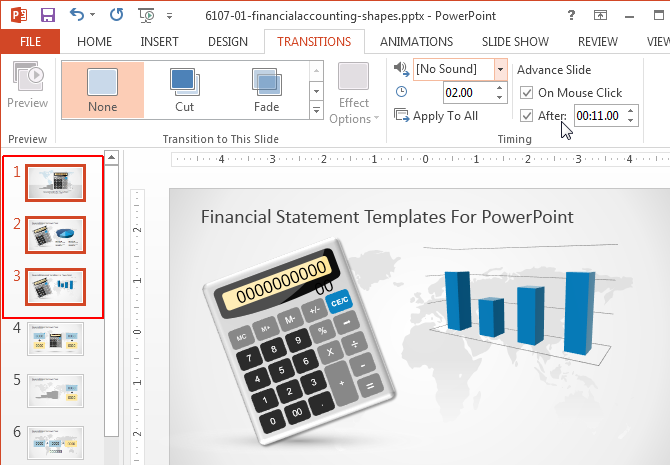 In this tutorial we will show you how to set time duration to switch slides in PowerPoint. 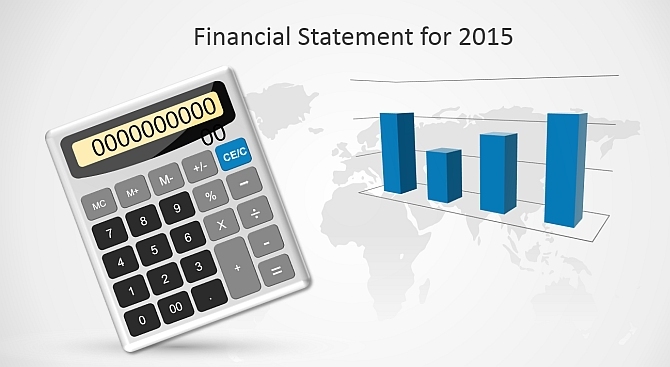 For the purpose of this post, we will be using the Financial PowerPoint Template. In the first step, click the slide preview for the slide you wish to set time for. In case you want all your slides to switch according to a set time limit (e.g. 10 seconds), select one slide and hit CTRL+A to select all slides. In case you want to set a different time for each slide, you will have to select each slide one by one and follow the steps shown below. From the Transitions tab, go to ‘After’ and add a time duration after which you wish to switch your slide(s). Also make sure that ‘On Mouse Click’ is unchecked. 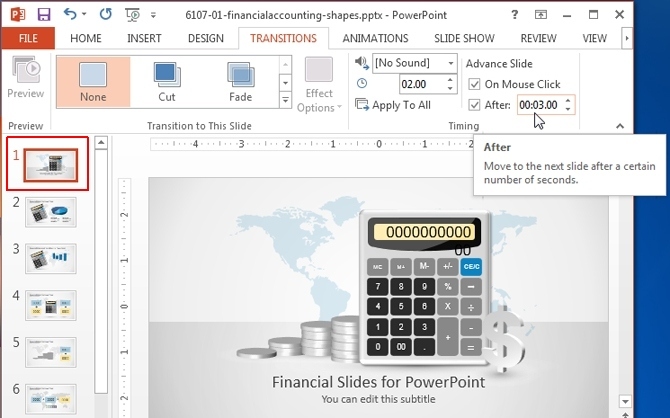 The process for switching slides is similar in various versions across PowerPoint and while we are demonstrating this method using PowerPoint 2013, you will find similar options in older versions (e.g. 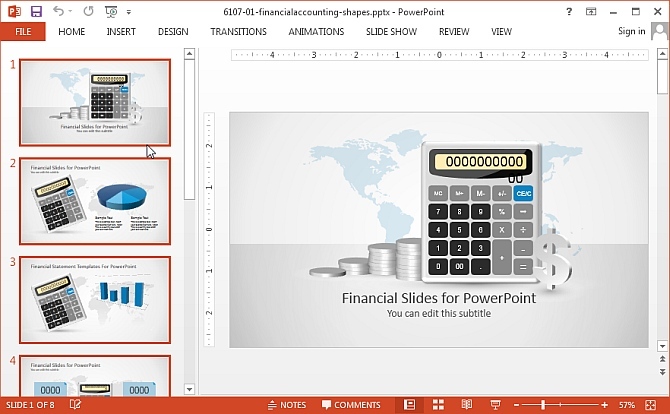 PowerPoint 2010). For a Single slide: For a single slide, select the respective slide from the Preview pane and add a time duration for switching the slide. For Multiple Slides: To apply the same time duration to multiple slides, select the slides from the Preview pane using CTRL+Mouse Click, go to the Transitions tab and set a time to switch them. As mentioned earlier, you can also select all slides by clicking a single slide preview, followed by CTRL+A. In case you have applied slide transitions, you can also set the length of the transitions using the ‘Duration’ option from the same section. Once you have followed the aforementioned steps, switch to Slide Show mode and your slides will switch according to the set time duration. While having well-timed slides might help in good time management, you nevertheless need good presentation slides to make an impression on your audience. 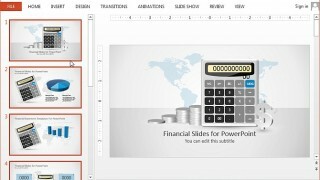 Slide Model provides High-Quality PowerPoint Templates with editable slide elements which have been designed by expert professionals to give you the imagery that can be attention grabbing and visually appealing. For more details, see our plans and pricing.